These are so delicious and can be accented with a variety of toppings. 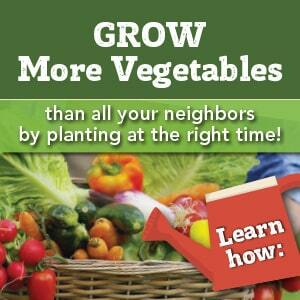 Pick some herbs or spinach from your garden and make your own flavors! 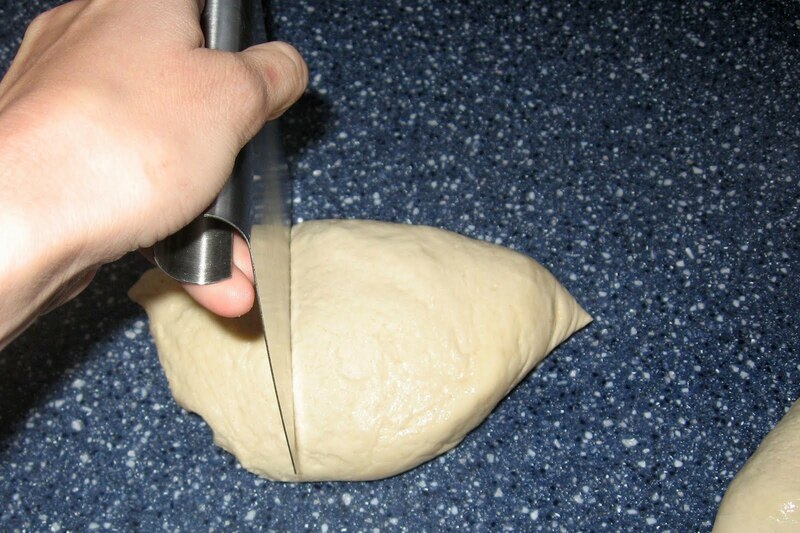 Combine all dough ingredients. Be sure to sift your flour! 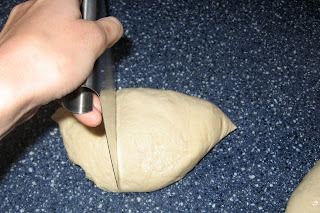 Knead (I used the mixer) until smooth and elastic. 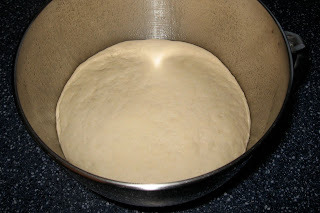 Plop into a lightly oiled bowl, cover with a damp towel and let rise for about an hour. When the dough is ready, turn your oven on to 500 and bring a big pot of water to boil. 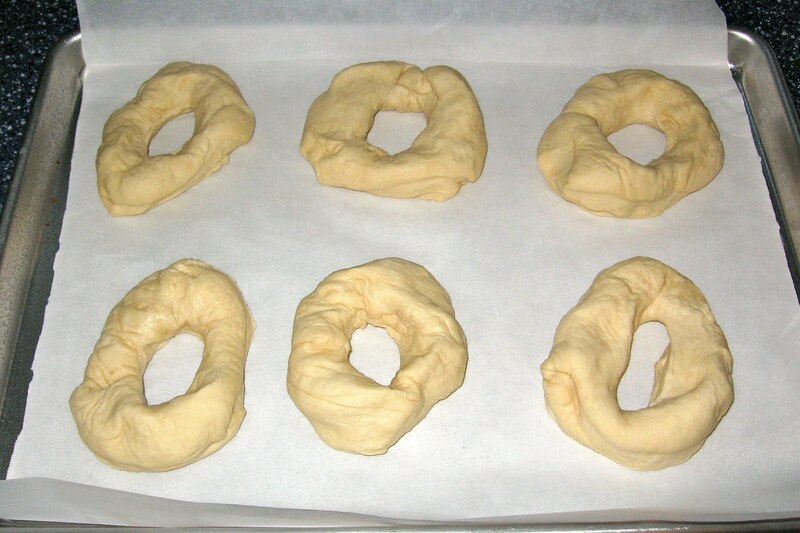 Now it’s time to start making bagels. 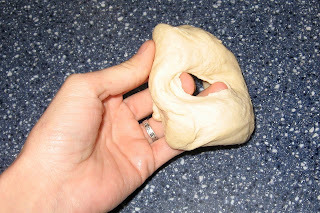 Dump the dough on a lightly floured counter and divide into 12 pieces (for regular size bagels) or 16 pieces (if you don’t want to be stuffed after eating). 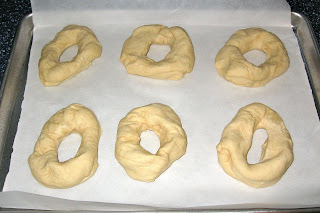 Poke your thumb through each chunk of dough and work it around into a bagel shape. This is much easier if you use both hands and don’t try taking a picture with one while bageling with the other. 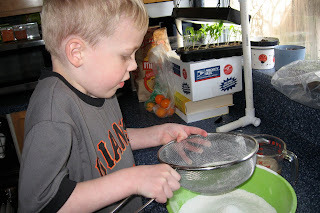 Set ’em all on a cookie sheet to rest while you get the water ready. 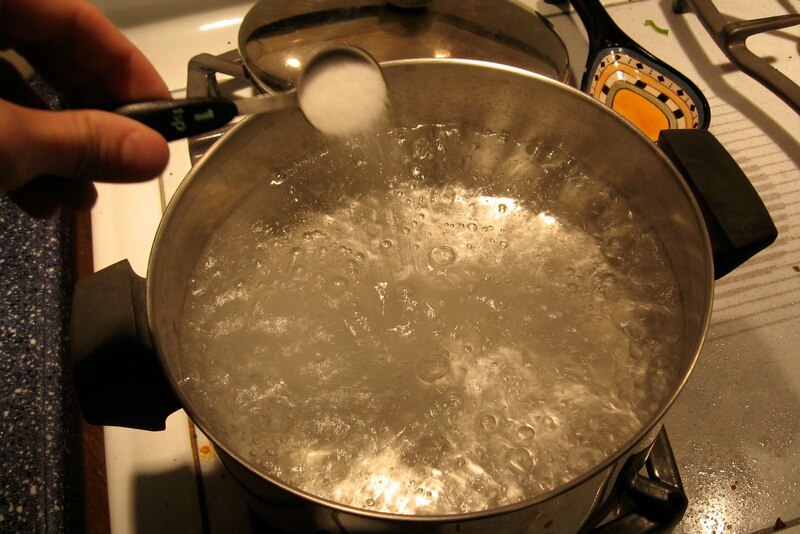 Your water’s boiling, right? 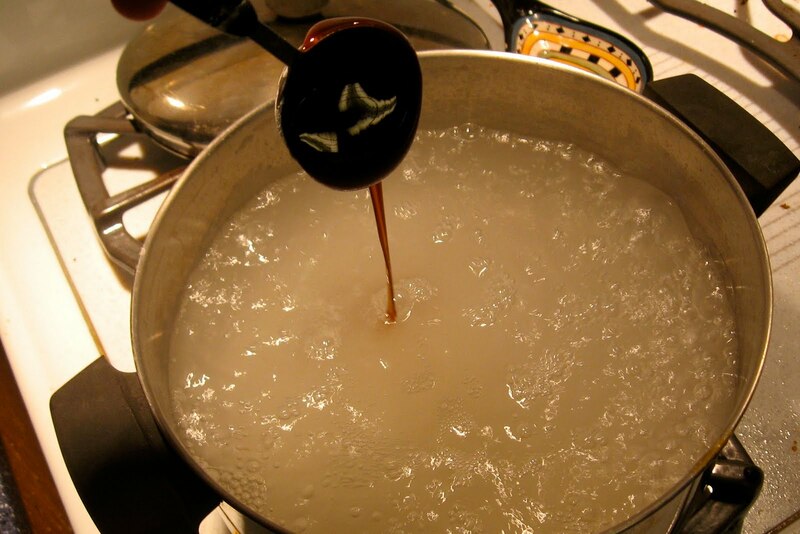 Now you can add the baking soda, salt, and malt syrup. 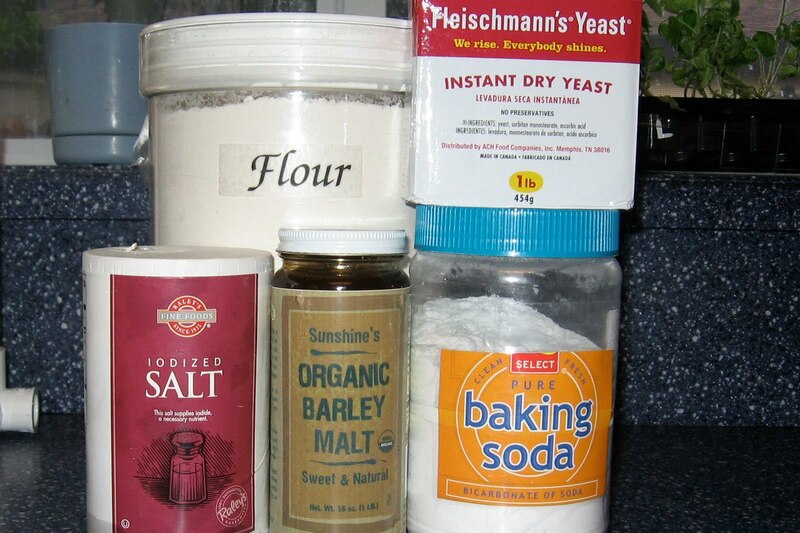 Just like with the pretzels, the baking soda will make the water foam up. Keep an eye on it and don’t let it boil over! The malt syrup will turn the water a caramel color. 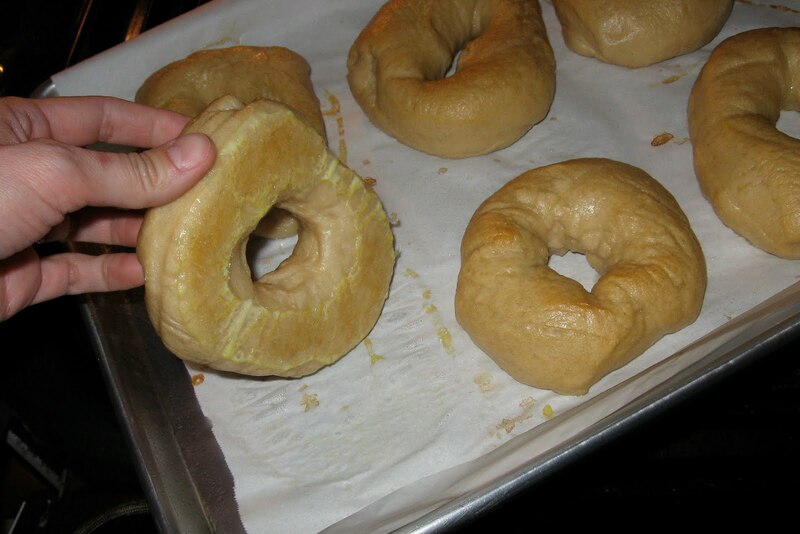 Slip three bagels in, one at a time. 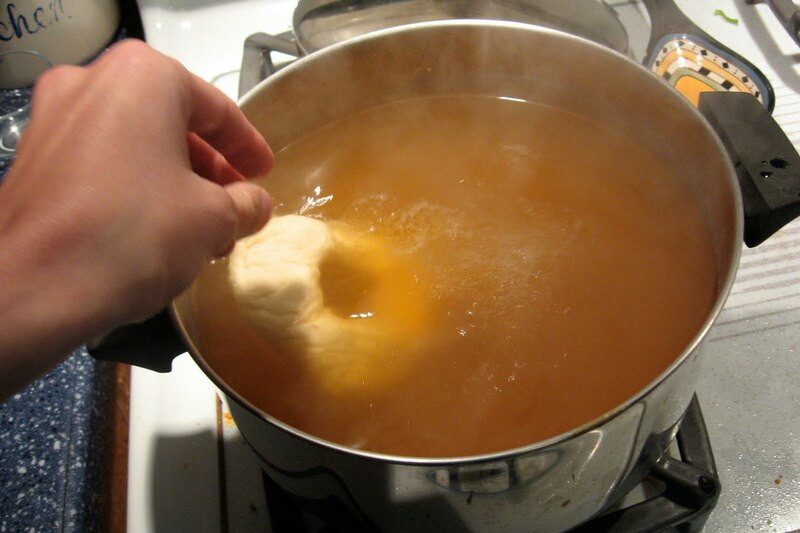 Boil them for a minute, then flip over and boil for another minute. Once they’re all poached, brush them with egg wash. Now’s the time to add toppings like grated cheese, sunflower seeds, garlic, onion, etc. Slip them in the oven and turn it down to 450. Bake for 8 minutes, then rotate the pans and check the underside. 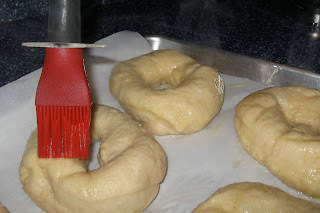 If they’re getting too dark, slip another baking sheet under this one (that will insulate the pan and keep the bagels from burning). Bake for another 8-12 minutes until golden brown. Enjoy! 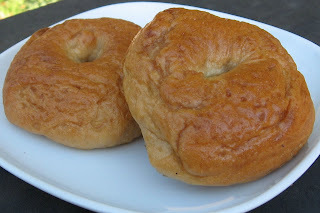 Yummy homemade bagels, I haven’t made them in decades! 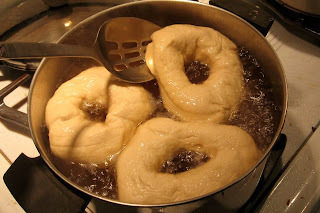 My favs are onion bagels, just slice and dice up a couple of onions. Mix them with some olive oil, less is more. And bake at 350F until dark and caramelly. Mix into your dough, boil and bake. Love them with ham, neufchatel cheese, and lettuce. Or with dry smoked salmon and neufchatel cheese! Yum, I think I definitely need to try these! 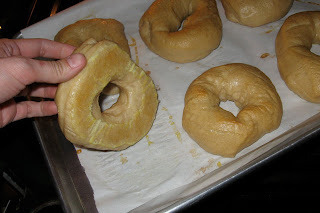 I’m in love with a bagel recipe on all recipes.com I vowed never to eat a commercially produced bagel again. Yum. Homemade bagels are the best.